The No. 67 Ford GT of Ryan Briscoe, Richard Westbrook and Scott Dixon looked to be in contention for the win at the 2019 24 Hours of Daytona, but missed out on the win after the red flag came out while the car was in the pits. The race got off to a poor start for the No. 67 Castrol-liveried Ford GT, which lost five laps in the pits early on after being forced to pit for mechanical repairs. The Briscoe-Westbrook-Dixon trio didn’t give up, though, slowly clawing their way back through the order using a combination of speed and strategy. 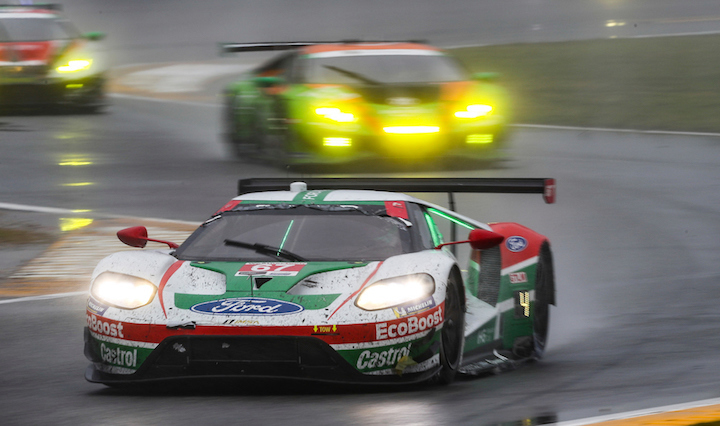 A bit of luck also played into their cause, with the Ford GT making up even more ground in the rainy conditions Sunday morning as rivals lost time. Soon the No. 67 was leading the GTLM field and appeared to be in good position for the closing stages of the races. The team then decided to pit for fuel under yellow, anticipating a restart, but was penalized for entering a closed pit when the race was red flagged shortly after. The race never resumed afterward and the Ford was classified fourth in GTLM. “We knew it was going to rain at the end, so they put me in the car, and I love the rain. I had to be really patient in the beginning, just getting used to the conditions. The GTLM class was won by the No. 25 BMW M8 GTE, with the No. 62 Risi Competizione Ferrari and the No. 912 Porsche 911 completing the podium. Click here for complete results from the 2019 24 Hours of Daytona.